In the final practice before the end of his team’s season, Terrell Walsh pleaded with the players to leave everything on the court the following day. 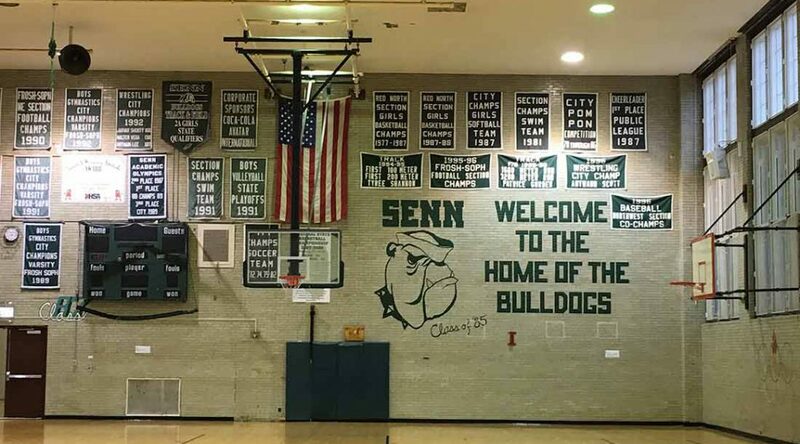 On March 1, the Senn Bulldogs boys basketball team was set to play in the school’s first regional semifinals in nine years. Senn isn’t known for its athletic prowess. Nearly every banner hanging inside the school’s gym marks an accomplishment earned in the 20th century. But that could be changing soon. Second-year principal Mary Beck is determined to improve the school’s sports program. “It’s something I’m dedicated to and I’ve been trying to build since I got there last year,” said Beck, a former high school basketball coach. Dr. Kevin Kniffin, a behavioral scientist at Cornell University, published a study in 2014 that examines the benefits of high school sports. The study, “Sports at Work: Anticipated and Persistent Correlates of Participation in High School Athletics,” argues that participation in high school sports results in more self-confidence and greater leadership ability, among other benefits. “As long as there’s a commitment that the benefits of sports-participation should be democratically or equally accessible, then it’s clear that school districts shouldn’t be cutting sports programs,” Kniffin wrote in an email to Medill Reports. Beck would like to see Senn’s athletics match the prowess of its arts program. Three Senn seniors recently completed the selective Chicago Arts Access Program designed through the School of the Art Institute of Chicago. Since becoming principal, Beck has made several coaching changes and devoted more resources toward athletics, although any amount would be considered an increase. Beck served as interim principal for the 2015-16 school year, after former principal Susan Lofton was ousted for conspiring with two other employees to keep 15 special needs students out of the school’s fine arts program. Lofton was far from an enthusiastic supporter of athletics at Senn, according to athletic director Robert Spurlin. In addition to the school’s teams suffering from a lack of resources, Lofton also went after the physical education program. According to Spurlin, Lofton occasionally replaced mandatory physical education with kinesiology, a class with no physical requirements that studied the mechanics of body movements. Senn historically has tried to expand students’ interests beyond the classroom. As a wall-to-wall International Baccalaureate school, every student participates in the IB program, a non-profit educational foundation that works with schools to better develop students and teachers. “Part of the IB philosophy, especially for all our ninth and 10th graders, is to be really well-rounded,” Beck said. A 2010 study by University of Minnesota professor Claudia Fox found participation in athletics played a beneficial role beyond academic outcomes. According to the study, sports participation also promotes identification with the school and school-related values. Beck sees sports as a bridge for the various programs and tracks to bring students together. Senn fell 78-40 to Lake View in the IHSA 3A playoff game March 1, but that loss hardly diminishes what the team accomplished this season. At 12-7, the Bulldogs finished the year with a winning record for the second time this decade, and with more combined wins than the team had between 2010-14. Spurlin was among those caught off guard by the team’s run to the postseason. Senn’s boys basketball team wasn’t alone in its success this season. The girls basketball team also finished 12-7, posting double-digit wins for the first time ever. The football team ended the year at 5-4, the group’s second winning season since 2010. Student support for teams could still improve. Spurlin said Senn had trouble filling seats for basketball games if tickets cost more than $1. Sophomore point guard Noah Chapman didn’t notice a boost in enthusiasm for the team among the student body. He’s hopeful that will change in the future as the team improves. “We just have to focus on getting better and the rest will come,” he said. Beck is pleased with the progress of the school’s teams she’s seen in the short time she’s been at Senn. With Beck in charge of the school and Spurlin at the helm of the athletic department, the future of the Senn Bulldogs finally looks bright.